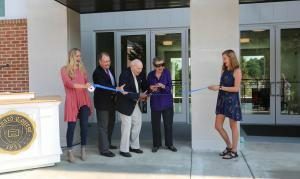 24Brevard College students residing in the newly constructed 84-bed residence hall will soon have a name to go along with their home away from home. On Tuesday, Sept. 27, at 11 a.m., the new residence hall will be officially dedicated as the William C. and Nancy B. Stanback Hall during a ribbon-cutting ceremony honoring two lifetime patrons of the College. The Stanbacks’ quiet support of Brevard College dates back to 1958, when William “Bill” Charles Stanback joined the Board of Trustees. Throughout a span of six decades, the Stanbacks contributed their time and resources without fanfare or expectations to areas such as the Loyalty Fund, capital projects and faculty development. They are considered by their peers to be model volunteer leaders, facilitating the leadership of other supporters through directed gifts, developing programs and personal challenges. The Stanbacks have dedicated their later years to philanthropic efforts. Aside from the College, they have served on numerous public service boards, committees and task forces. They have extended financial support to a number of educational institutions, as well as many civic endeavors in and around their home of Salisbury, North Carolina. Bill Stanback graduated in 1943 from UNC Chapel Hill with a Bachelor of Science degree in Commerce, while Nancy Stanback finished an undergraduate degree with the Class of 1961 at Randolph-Macon Woman’s College. Bill continued his education at Harvard Business School, obtaining a Master of Science degree in Business Administration before joining the family business, Stanback Headache Powders, as advertising manager and later president. He sold the company to GlaxoSmithKline in 1989. The Stanbacks are active members of First United Methodist Church in their hometown of Salisbury and Bill served as Mayor of the City of Salisbury from 1974-1975. In 2001, the couple purchased a historic Italianate-style home built in 1872 and spent nearly a year restoring it. Nancy loves to cook and entertain, and together they enjoy reading the newspaper on their porch. The Stanbacks have six children. The new residence hall is the first phase of a larger, long-range project, which includes a second new residence hall and the addition of green space to create a more pedestrian- and cycling-friendly campus. The $6.38 million project to construct William C. and Nancy B. Stanback Hall was funded by a loan from the U.S. Department of Agriculture. In October 2014, the administration unveiled the design to students and used their feedback to improve the plan. The building was complete in August – just in time for upperclassmen and -women to settle in for the fall semester. The new building was constructed to include energy-efficient features and recycled materials. A combination of suite-style and single rooms encourage communal living with amenities and common living areas. On a clear day, students have sweeping views of the College’s new athletic turf field flanked by the Blue Ridge Mountains. Nancy Stanback said she and her husband are happy to lend their support to what they feel is a “wonderful small school” in an ideal location with a great group of students.